Enzo is a Finnish company that makes all kinds of knives, including blade blanks, and kits with the scales, rivets, and blade blank. I bought a kit, the Elver model, to give it a try. The kit comes as shown above. Scales, knife blank, Corby rivets, and sheath. It is about $60, even with shipping from Finland. U.S. knife suppliers also carry Enzo kits. I choose Micarta scales, and a blade in 01 steel, with a Scandi grind edge. The edge is sharp enough to take hair off the arm right out of the box. 01 steel is a type of steel which is a good compromise on corrosion resistance, ease of sharpening, holding a blade, and being durable for all around use. This is an awesome knife for bushcraft, hunting, or backpacking. You can do without a substantial knife when backpacking, but if you need it a sturdy blade like this is much appreciated. Like when you forget your tent poles and have to fashion your own out of willow (done that). 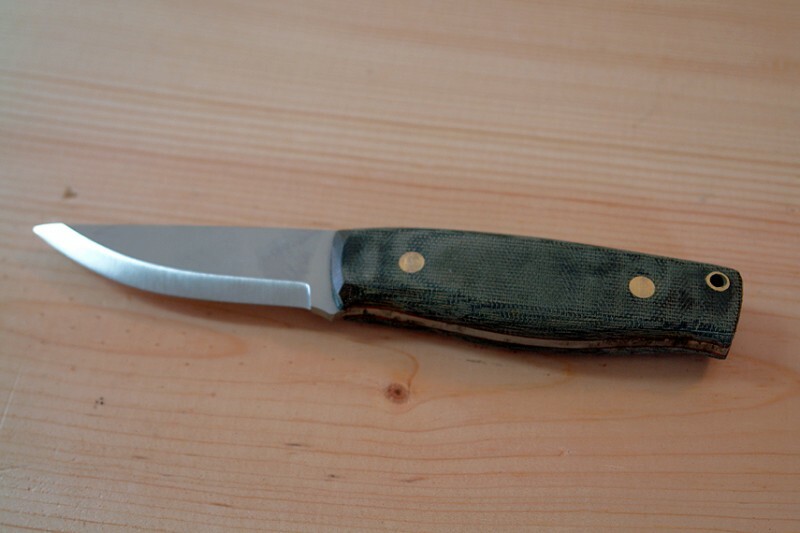 Micarta is a material made of a cloth like denim, encased in epoxy. Unlike wood, it will not absorb water, split, dry out, or otherwise fail. Above: You'll notice the scales in the kit don't have a hole for a lanyard, but I wanted a lanyard hole. I put the blank on a board, clamped it down (that was stupid, I scratched the blade doing that), drilled holes though the handle holes. Then I put the bolts in the blade to position the blade, then positioned the blade on the board, with the lanyard hole in the blade directly under the drill, and secured the board to the drill table. Then I put the scale on, and drilled the lanyard hole. I did the same thing to the other side, and got a lanyard hole in each scale fairly true to each other. For a brass tube I found a small brass tube at Home Depot, originally for plumbing. The next task was to glue (using epoxy) the scales to the tang of the blade, while tightening the bolts, and putting the lanyard tube through the handle. The whole mess was epoxied together, clamped, and left to dry. This (above) is what the knife looked like with the clamps removed. The bolts would be filed down, and the handle trimmed to match the tang, and shaped with a rasp and a lot of sanding. This is what the handle looked like with the bolts filed down, and the scales generally shaped to the shape of the tang. When working on the blade I put tape on the blade to cover the super sharp edge. Above is what it looks like finished. Ithas imperfections all over, but my theory is that those are left there deliberately to prove that its handmade. Above, the look of the red liners along the back of the knife. Above, close up of the handle, a rivet, and the lanyard hole. I sanded down to 4000 grit on the rivets to give them a mirror surface. I went down to 600 grit on the handle, then put on a finish of carnuba wax with a polishing wheel. I have the next project teed up, another Enzo Elver, but not from a kit. It will have curly birch handles, and red liners under the scales.